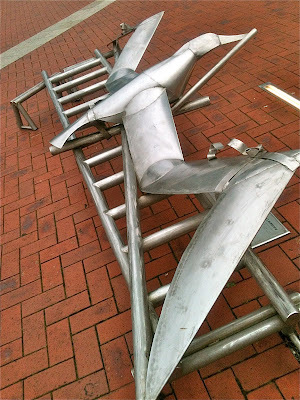 Niki Buchan and I had a day off in Auckland, New Zealand last week, so we took a walk down to the harbor area where we came across a piece of public art called "Albatross Trainer" by artist Greer Twiss. I'll admit to not reading the "artist's statement" which was on a nearby plaque because, quite frankly, as an artist myself, I tend to believe that the artist has already made his statement with his artwork. Figuring out what it's all about is up to the rest of us. This piece made me sad, to be honest, seeing a great bird strapped to a flight trainer like this, as if mankind, in our hubris, thinks we can somehow improve upon nature's plans for teaching an albatross to fly. I mean, we need flight trainers for human pilots because, of course, we were not all born to fly, but to suggest a bird needs this kind of help is a kind of tragic ridiculousness, something we see far too often when it comes to young children. I couldn't help but think of a comment Niki had made earlier in the day: "People in offices keep writing curricula and the kids keep learning the way they always have -- by playing." It's crazy, all these folks trying to sell us on products or methods or systems designed to "help" children do things like stand or sit or walk or talk or read or count, things they do as naturally as an albatross flies. I mean, there are literally dozens of types "walk trainers" out there for our babies. Really? There are devices designed to help babies sit up before their muscles are even close to being ready. Is this really a problem? Is there an epidemic of babies not learning to walk or sit up by themselves? Of course not; every normal baby already learns these things without any help from any kind of "trainer" other than, you know, the world in which they find themselves living. By the same token, do we really need "cute" apps to teach children "counting and language skills," which is a direct quote from just about every spam email I receive these days? Do we honesty believe we can improve upon talking with children and giving them time and space to play, which is the way nature has always taught foundational counting and language skills? I guarantee there will never be an app that can do a better job than that. 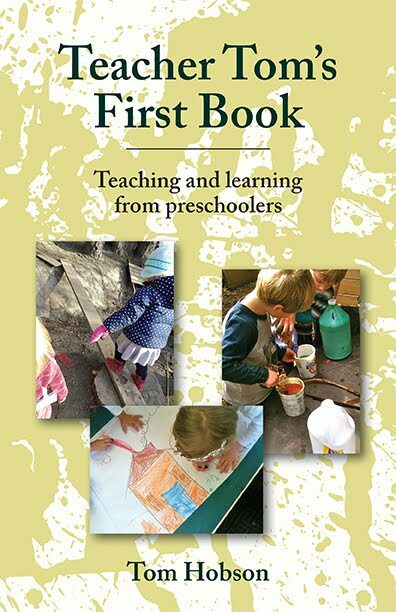 Do we need written programs for what and how we expect young children to learn, devised by people who clearly have no how idea how they themselves learned the important things they know? Of course not. People in offices keep writing curricula and the kids keep learning the way they always have -- by playing. We spend billions of dollars on these things every year, these albatross flight trainers, to which we strap the wings of children. Beside this grounded albatross, the artist has mounted a half dozen others on steel poles, awkwardly flying overhead, if you can all it flying. There is none of the grace or magic in these hobbled sea birds than there is in an actual bird in flight, although I suppose, if you squint and forget what it ought to look like, you can say, "Hey, look! They're flying!" much in the way parents enthuse that Junior learned his A-B-C's or shapes or colors from an iPhone. You can call it learning, I suppose, but it comes at an enormous cost both in dollars and opportunity, as well as, tragically, freedom. Children are born not only ready to learn, but knowing how and what to learn. They may well, if they know nothing else, be made to willingly put their wings to a trainer, if only to please their task-master because they do seek to please, but it's only when we finally take them off that a child can really learn to fly.